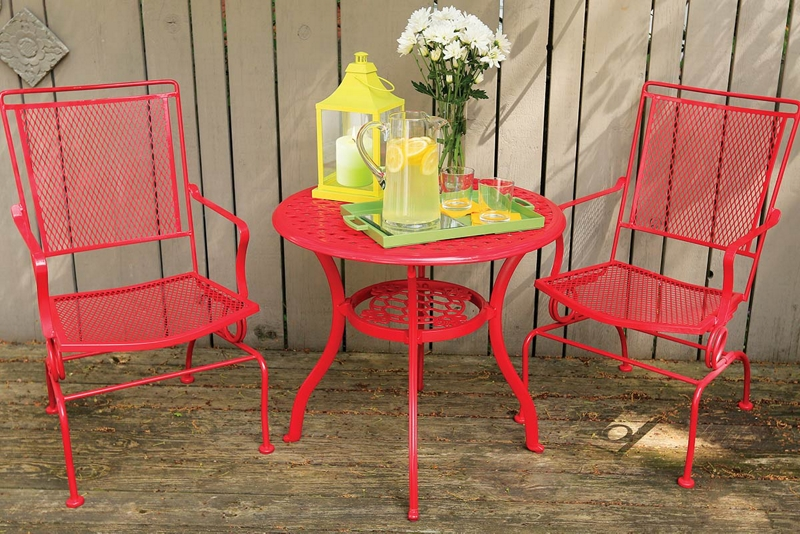 Transform outdoor metal furniture from old and rusty to sleek and stylish with Krylon® ColorMaster™ Paint + Primer. View additional outdoor spray paint projects from Krylon®. Using an all-purpose cleaner, thoroughly clean the table and chairs to remove dirt, oils and dust. Rinse thoroughly with water and allow to dry. If paint or rust is flaking off the surface, use a wire brush or sandpaper to remove it. Wipe clean. Use Krylon® ColorMaster™ Primer to help cover any corrosion on the metal table and create an even painting surface. Holding the can of primer 6-8 inches from the surface, begin priming the underside of the table using a sweeping side-to-side motion with slight overlap. Allow primer to dry for at least 10 minutes. Turn table right side up and prime the top, again allowing primer to dry for 10 minutes. Using Krylon® ColorMaster™ Paint + Primer - Gloss Banner Red, paint the underside of the table, holding the can 6-8 inches from the surface and using a sweeping side-to-side motion with slight overlap. Continue to apply light, multiple coats, waiting 30-60 seconds between each, until you are satisfied with the appearance. Turn table right side up to paint the table top, repeating steps 7 and 8. Use Krylon® ColorMaster™ Primer to help cover any corrosion on the metal chairs and create an even painting surface. Holding the can of primer 6-8 inches from the surface, begin priming the chairs using a sweeping side-to-side motion with slight overlap. Using Krylon® ColorMaster™ Paint + Primer - Gloss Banner Red, paint the chairs, holding the can 6-8 inches from the surface and using a sweeping side-to-side motion with slight overlap. Krylon® ColorMaster™ Paint + Primer dries in 10 minutes or less and can be handled in about one hour.